Due to its age, condition and social legacy, Shreiner-Concord Cemetery is considered to be a contributing element within the City of Lancaster National Historic District, as designated by the National Park Service. It is located within the City of Lancaster Heritage Conservation District and immediately to the east of the boundary of the City of Lancaster Historic District. The first burial at the cemetery was on January 13, 1836 for Mary Fritz, daughter of Christian and Catherine Fritz. An additional 116 people were buried between that first burial and Martin Shreiner Sr.’s burial there in 1866. The most recent burial is Laura Gauler Heltzle on April 2, 1993. The total number of burials in the cemetery is 396. Burial records indicate a total number of four African Americans interred in the cemetery. The presence of Stevens’ grave and memorial brought further recognition in 2006 by the U.S. Department of the Interior/National Park Service when the property was designated as an authentic Site in the National Underground Railroad Network to Freedom Program. This designation affirms Stevens' role in directly supporting the activities of the Underground Railroad, as well as his life-long work to advance civil rights and equal protection under law for a broader range of Americans. "I repose in this quiet and secluded spot, not for any natural preference for solitude. But finding other cemeteries limited as to race by charter rules, I have chosen this that I might illustrate in my death, the principles which I advocated through a long life. Equality of man before his creator." U.S. 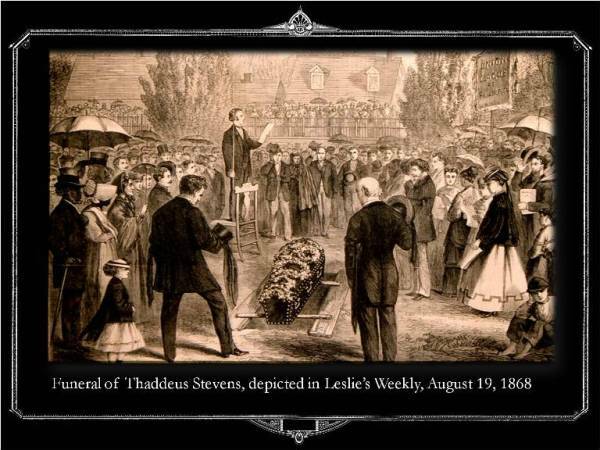 Congressman Thaddeus Stevens (1792-1868) was a pivotal figure in the public affairs of Pennsylvania and the nation from the 1820s through 1868, when he died in Washington D.C. As a state representative he championed free public education in the early-mid 1830s. During two terms in the U.S. Congress, he was a member of the Whig Party (1849-53) and helped to found the Republican Party (1859-1868). An avowed Abolitionist and Constitutional scholar, Stevens played key roles in the passage of the 13th and 14th Amendments to the U.S. Constitution. He also laid the groundwork for the 15th Amendment, enacted after his death. The “Great Commoner” was one of the prime movers of Reconstruction and was the leading advocate for the Impeachment of President Andrew Johnson. Stevens was an Underground Railroad activist during his residency in Lancaster, PA (1842-1868). 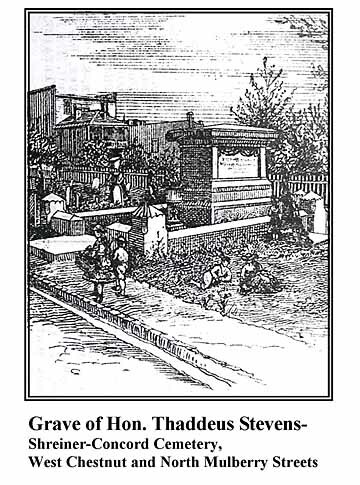 Congressman Stevens’ grave and memorial, weighing more than 17 tons, was installed on 5 December 1872. "Altogether the monument is a very massive and substantial looking affair,” reported the Lancaster Intelligencer Journal, a reflection of the life of one who so substantially changed American history. The following is excerpted from a letter to the editor to The Daily New Era, Lancaster, Pa., by Hon. Charles I. Landis, President Judge of the Second Judicial District of Pennsylvania, November, 1916. “Mr. Stevens died at Washington on August 11, 1868, and he was buried in Shreiner's Cemetery, in Lancaster, on August 15, 1868. He gave no directions in his will as to his place of burial, but it is said that he requested that he should be buried in this cemetery because the charters of the Lancaster and Woodward Hill Cemeteries, in which he had had lots, restricted interments to white persons. He prepared his own epitaph, which is upon his tomb. True to those principles of equality which he steadfastly maintained in life…he wished to repose in a plot where no limitations prevailed as to color, race or creed. Martin Shreiner was in his day one of the prominent and reputable citizens of Lancaster city. Many of his descendants continue to live here, and a number of them are buried in the above-named cemetery. In his lifetime, he laid out, as a place of burial, a plot of ground at the corner of West Chestnut and North Mulberry streets. 1878- Martin Shreiner and Elizabeth Eichelberger, "Record of Burials at Concord Cemetery, Part 1:1836-1878", Lancaster Mennonite Historical Society. 1916- Charles M. Gibbs and Henry M. Shreiner, “Record of Burials at Concord Cemetery, Part 2:1879-1916", Lancaster Mennonite Historical Society. 1941- William Frederic Worner, Tombstone Inscriptions—Graveyards in Lancaster County, Vol. 8, The Lancaster County Historical Society. 1987- "Concord Cemetery", Lancaster County Connections, vol.4, no.3, p.57-69, and vol.4, no.4, p.74-83. Fergus M. Bordewich, “Digging into a Historic Rivalry,” Smithsonian Magazine, February, 2004. Fergus M. Bordewich, Bound for Canaan, The Epic Story of the Underground Railroad, America’s First Civil Rights Movement, Amistad, An Imprint of HarperCollins Publishers, 2005. Beverly Wilson Palmer, The Papers of Thaddeus Stevens, Vol. I, University of Pittsburgh Press, 1997. R.C. Smedley, History of the Underground Railroad in Chester and the Neighboring Counties of PA, 1883. Hans Treffousse, Thaddeus Stevens—19th Century Egalitarian, 1997. Unless otherwise noted, photos and website content by Randolph J. Harris, consulting historian: Author and applicant to National Underground Railroad Network to Freedom of nominations of Stevens Grave and Monument; Stevens’ Home and Office, both in Lancaster; and Stevens’ Caledonia Iron Works, Caledonia State Park, Franklin County, PA. 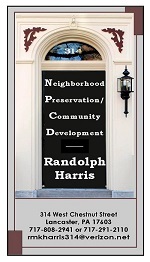 Contact: rjharris441792@gmail.com	or 717.808.2941.